Today’s WhatIs.com Word of the Day is Internet of Things, a scenario in which every single thing you can think of has a unique identifier and the ability to communicate over the Internet or a similar wide-area network (WAN). The concept has been around for about ten years when it was first associated with RFID tags, bar codes and supply chain management. Today, IoT is a hot buzzword used in city planning, big data analytics, automobile manufacturing — and just about any other industry you can think of. I get it. Internet of Things is another name for machine-to-machine (M2M) communicaiton. Pervasive computing. “Smart” everything. It’s especially a hot topic for privacy advocates. They don’t like the idea one bit. My smart car sends data to my phone to tell me I have half a tank of gas left. My smart electric meter can send usage data to the power company and my son will never get a job as a meter reader. But I didn’t REALLY get the concept of Internet of Things until I saw a foal being born three months ago. You see, this particular foal was bred to be a show horse. Her birth required a lot of help from the Internet and this little filly is one of the “things” in the Internet of Things. She’s not a machine, she’s a real live horse. But her parents each have a unique identifier — she has a unique identifier — and without the Internet, machine-to-machine communication and real-time analytics, she would never have been born. 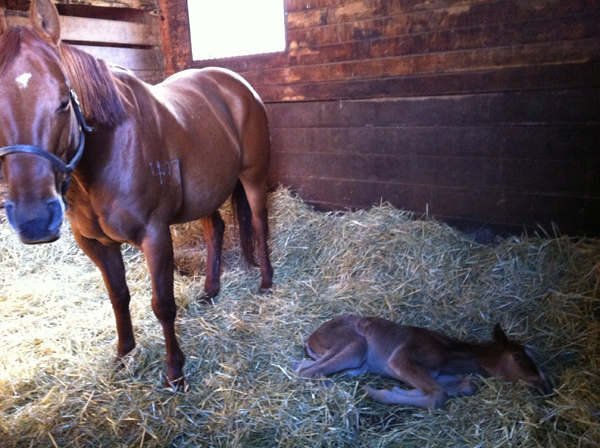 The horse that just gave birth in the picture above is a brood mare — a surrogate. The filly’s real mother is a show horse worth tens and tens of thousands of dollars. The people who own the show horse wanted to breed her — but decided to have a surrogate carry the foal. Horses carry their young for 11 months — that’s a year off the show circuit, which translates into a financial loss. And if something went wrong during the pregnancy and the mare died, the owner would lose any chance for future income from the horse. For similar risk-management reasons, the filly’s dad is a sperm donor. Yep, show horses are an investment. So far, this story is kind of “old school.” The scenario above could have taken place on any horse breeding farm in the 1970’s. The only technology involved is maybe a telephone. There’s no Internet of Things. It’s just another artificial insemination story. Yawn. After the show mare’s owners decided to bred their award-winning mare, they needed to find a surrogate whose breeding cycle matched their own mare’s. They used the Internet and a distributed database, not a telephone, to find a compatible mare. The information in the database is captured in real time from equine veterinary records around the world and the records contain real-time data sent by enhanced RFID chips implanted in the horses. The brood mare just happened to be out in Wyoming running with a herd, so a helicopter equipped with an RFID scanner found her and separated her from the rest of the herd. Timing was everything and it couldn’t have happened without the Internet. The logistics were coordinated with the help of UPS so the egg and sperm would arrive at exactly the same time and the brood mare could be impregnated. Once the vet in Wyoming determined there was a viable pregnancy, the brood mare was returned to her herd and monitored by the GPS in her chip and satellite imaging. Her vet monitored her remotely; heart rate and temperature were just a mouse away. Seven months later, the helicopter went out and culled the brood mare from the herd again so she could be flown to Ravena, New York, where the trainer took charge of the brood mare and awaited the foal’s birth.Three months after that, the show horse’s filly was born, healthy and beautiful. The filly was chipped with an even more enhanced RFID technology than her parents have. When she grows up, she’ll have a tag on her halter that automates how much grain she receives. Her water trough will know when it’s low and automatically refill itself. Sensors in her stall will regulate the temperature by turning on fans or turning on the heat. Her trainers can use desktop, iPad or iPad apps to monitor the filly’s heath and report on whether she’s in a stall or out grazing in a pasture. When I heard this whole story about the helicopter scanner using the mare’s RFID tag to locate the right horse, it finally clicked. This filly, who is about the size of a llama now — and puts everything in her mouth just as every baby does — is a walking, grass-eating member of the Internet of Things. And if we humans work out the privacy issues that surround the concept, so will we be some day. The filly doesn’t have a name yet. I’m voting for IoT.